Indian spinning mills are dependent in some core areas on foreign technologies/machineries because of non-availability of good quality locally made machineries or technologies. 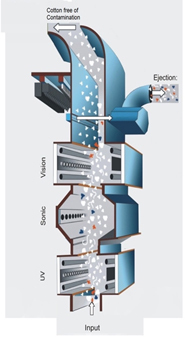 One such area is the Blow Room contamination remover system where the local made machineries are found wanting in quality performance and many mills are forced to opt for imported machineries whose import cost are expensive by at least 2 times and their maintenance cost too are higher. 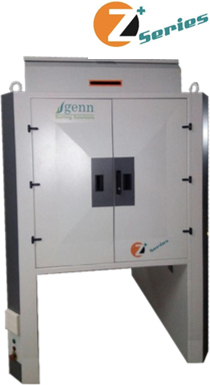 GENN, a specialist in the manufacturing of color sorting systems and having vast experience in the agricultural industrial fields, has developed a high technology blow room contamination remover GENN Z+ series. Genn’s imaging technology gives much better imaging spectroscopy under light source to identify all colored foreign fibres. Genn’s Z+ series detects Optically brightened Polypropylene (PP) contaminations by using UV lights. High Frequency Acoustic waves give more reflectance in Optically Non-Brightened PP. TEFOC and GENN together have made detailed performance study and herewith wish to bring to our customer’s knowledge the various benefits and facts of GENN Z+ contamination cleaners. The GENN Z+ series is capable to work in blow room’s up to 1000 kg/hour. Optical sensing for colored contaminations. 8 no’s of 2048 megapixels True Colour camera with high resolution is capable to detect 7600 samples/sec. Such a high sensing capacity makes detection of smaller contaminations possible even the up to size of 0.08mm. These cameras are supported by 8 LED illuminators for high efficiency in detection. 8 no’s of 2096 megapixel Ultraviolet spectral range high precision camera for exclusively detecting the bright and semi bright contaminations. UV lamps with the Luminous Flux ranges with 2500Lv for better performance. This high resolution is capable to detect 7600 samples/sec. 24 unique sensors with transmission range of 125 kHz to detect white polypropylene (PP) and transparent plastics. Advanced Image acquisition system features intelligent processing algorithm. Robust embedded design provides incomparable arithmetic capability and perfect program design create solid performance throughout the system. 4th Generation Processor embedded for promoting the speed & increase the efficiency of mass data process & sorting accuracy. High Performance LED Optical System designs ensures maintenance free. Lower energy consumption, less heat & longer life. LED Light provided uniform lighting throughout area and gives better life time greater than 50000 hours. Innovative smart LED shadow less cold light system design can effectively find out small spots, light yellow & core white contaminations much easier &accurate. The signals received from the cameras and sensors analyzed thoroughly by software-based system which clinically separates the contaminations and ejections initiated. Exclusive sorter solenoid valve with ultra-low air consumption ensures optimized carry over ratio and high sorting accuracy. High Speed Precision serviceable ejector can remove 77 contaminations /sec. The 24nos pneumatic valves are MAC make which is a proven brand with high operating efficiency. GENN: R&D which expertise in multiple industrial fields has developed a software detection system with right algorithms to identify contaminations which erstwhile were difficult to detect. Genn made special Human Machine Interface with intelligent operating system can be mastered and operated easily .7-inch TFT screen with touch screen facility provides multiple ON screen information, data input and connection to LAN, MOBILE, etc. Remote monitoring of various data as well as settings controls through mobile is provided. These results are comparable to the best in these ranges of machineries with its maintenance cost being nominal. This system pays back in quick time to the users.